The State Championship season is finally upon us with the start of the Sectionals. So let's take a look at the state of the sprinting events and see who the top athletes are and who might contend with them. Event rankings go 1,000 athletes deep. 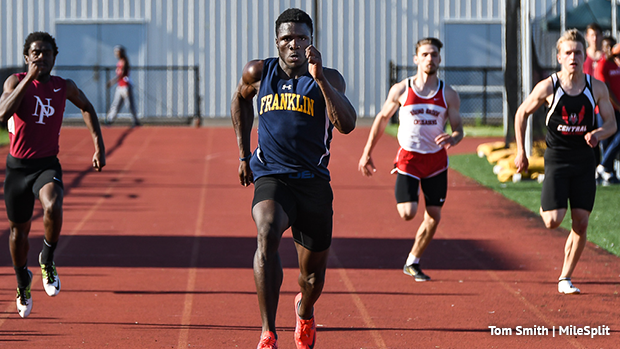 After his record breaking indoor season, it should come as no suprise that Franklin junior Mario Heslop is dominating the state's sprinting scene this spring. Heslop, the indoor Meet of Champions winner in the 200 and 400 and runner-up in the 55, is NJ #1 in both the 100 (10.51) and 200 (20.97) and is NJ #2 in the 400 (47.50). Helsop's 20.97, which came at the Skyland Conference Championships, is a state Junior Class record and No. 2 in state history, just off the state record of 20.93, which was set by Danny Johnson of Rahway at the 2001 Meet of Champions. Heslop, who ran state sophomore record times in the 100 (10.44) and 400 (46.84) when he won those races at the State Group 4 Championships last spring, is the only runner in the state to go sub 10.50, sub 21.00, or sub 47. The bottom line is that Heslop is the favored to finish first at the Meet of Champions in whichever sprint races he runs. 100- So who is Heslop's biggest compeition in the 100? Well, there are only three other guys in the state who have broken 10.80 this season. They are Bergen County winner Cameron Shaw of Ridgefield Park (10.71), Essex County champ Nick Parisi of Seton Hall Prep (10.71), and Hudson County champ Bervensky Pierre of Dickinson (10.74). 200- Among those chasing Heslop in the state rankings are seven sub 22.00 sprinters, led by Antonio Tarantino of Paul VI, who is NJ #2 with the 21.48 he ran to win the Camden County title. Parisi is next at 21.73, and he's followed by Charles Fields of Wildwood Catholic (21.76), Revell Williams of Bridgeton (21.78), Buntin (21.89), Sylis Raiford of Atlantic City (21.89), and Nils Wildberg of Princeton (21.93). 400 - Heslop and senior Nadale Buntin of J.P. Stevens are the only sub 48 runners in the state this season. Buntin, second to Heslop in the 400 at the Indoor M of C ran a NJ# 1 47.49 to win the GMC title. The next fastest after Heslop and Buntin are Andrew Canale of Christian Brothers Academy, who won the Monmouth County title in 48.38 and Brandon Laraque of Woodbridge, the GMC runner-up in 48.38. Tahkwan Ingraham of Union, who won the Union County title in 48.41. Rahway's Marvin Polynice is also under 48.50 with the 48.44 he ran to take second behind Ingraham at the Union County meet. Lindo's stiffest competition in the 110 hurdles is expected to come from his teammate Al-Tariq Dunson (NJ #2 14.07) and Indoor Meet of Champions 55 HH winner Sincere Rhea of St. Augustine Prep (NJ #3 14.14). Also look out for Union County champion Ola Akande of Rahway, who has gone a NJ #4 14.19. In the 400 hurdles, there are only two other athletes other than Lindo who have gone under 54. They are Jameson Woodell of Hunterdon Central, who won the Skyland Conf. title in a NJ #2 53.41, and Ocean County winner Abdolahe Diawara of Toms River North (53.68). The next fastest is Cranford's Josiah Cadet, who won the Union County title in a NJ #4 54.01.